I’ve been working really hard lately and haven’t had time to really cook or even enjoy my meals. My family and my co-workers have been taking good care of me, cooking some meals for me or bringing in vegan sandwiches for lunch. I’m lucky and grateful! But today, before I continue working some more, I wanted to make myself a satisfying breakfast. 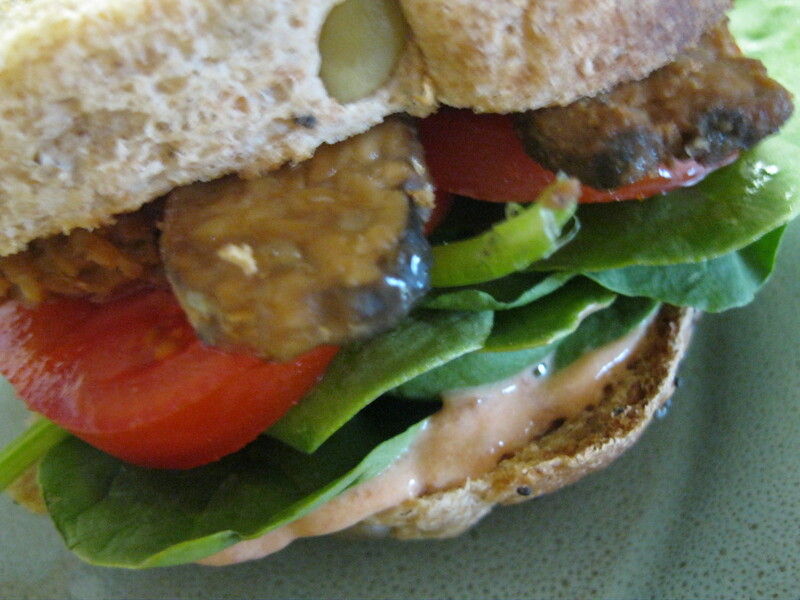 Tempeh and I haven’t always been good friends. I eat it but I’m often underwhelmed by it. Today, I tried out something different and super easy. 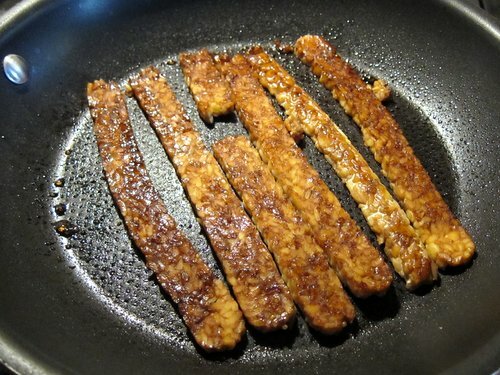 I cooked the tempeh with a mixture of 2 tbsp soy sauce, 1 tsp of maple syrup, and a dash of liquid smoke. It looks and smells pretty as it cooks. For you Filipinos out there, I think this is a great (though less garlicky) alternative to longanisa that doesn’t take a lot of effort or require hours of marinating time. This would have been great with some garlicky fried rice, but I’ve had a lot of rice lately. So I roasted some potato straws instead, sprinkling them with garlic salt. I completed the meal by making a tomato salad, seasoned with salt and pepper. 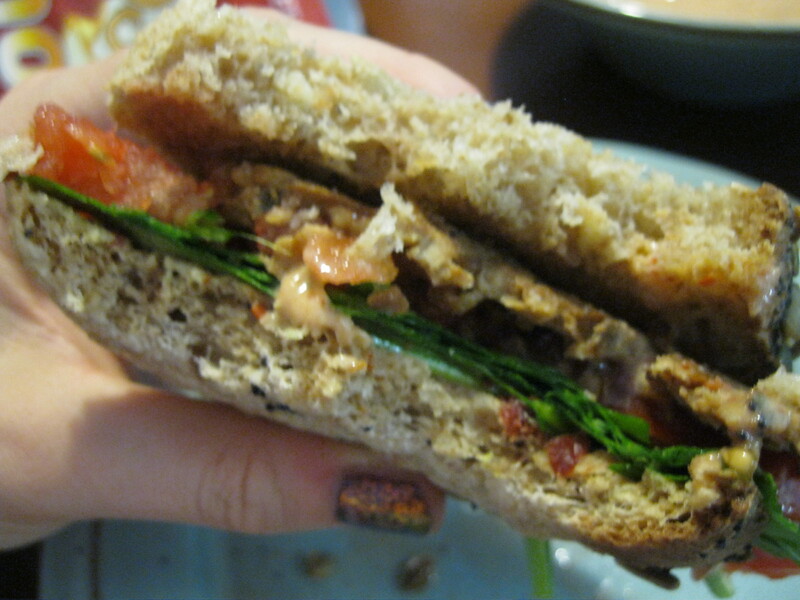 Vegan BLT… like a party in your face! This is so simple I feel like I’m cheating by posting it. We wanted BLT this Monday. 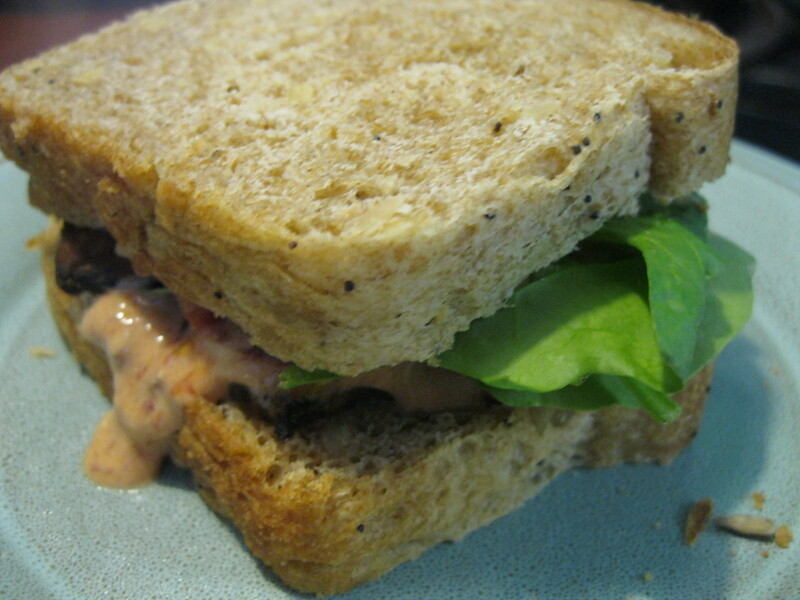 We’ve got a reliable source of vegan gluten-free bread so the next step is to make it awesome. 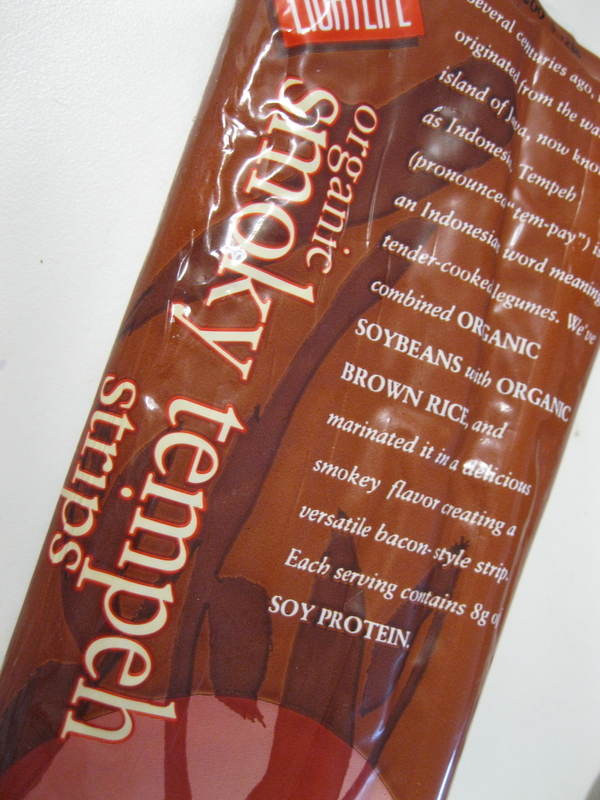 All you need is some smoky maple bacon tempeh. We bought outs pre-flavored but a tablespoon of maple syrup and drop of liquid smoke or pinch of smoked paprika works perfectly. We sprayed a pan lightly with some olive oil and sauteed it until it was browned lightly. We mixed up some chipotle lime mayo by combining the juice from 1/2 a lime, a heaping tablespoon of nutritional yeast, a pinch of vegan sugar, 1 carton of silken tofu and 1 8 ounce tin of chipotle peppers (this will make it REALLY spicy) use 2-3 peppers for an amusing kick of spice) in the food processor and blending until smooth. I spread that on a piece of bread, added some tomato and spinach, so technically it’s not really a BLT, it’s a TST but who’s counting anyways. These babies disappeared really fast. This is Christie and Brent, signing off. This morning, I found myself missing smoked sausage. 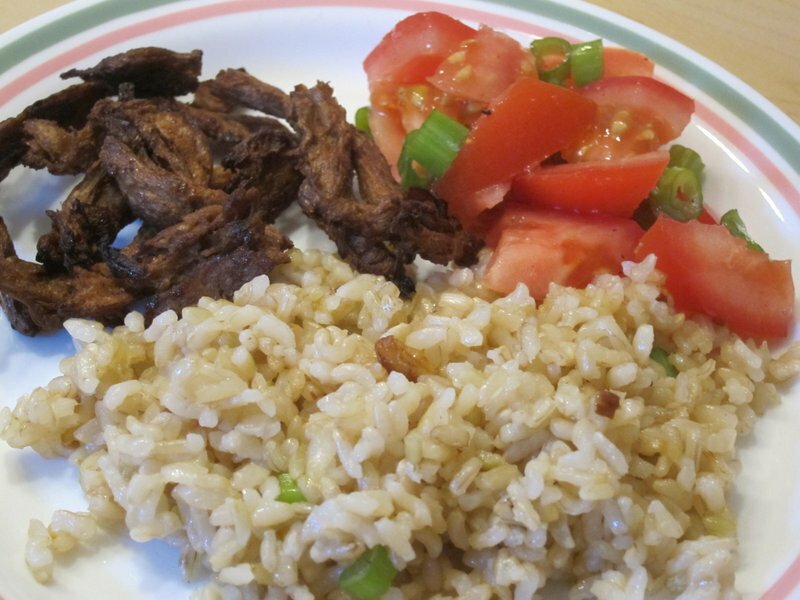 On weekend mornings, we would often have smoked sausage or hot dogs with fried eggs, fried rice, and tomatoes (we’re Filipino so this is completely normal for me). 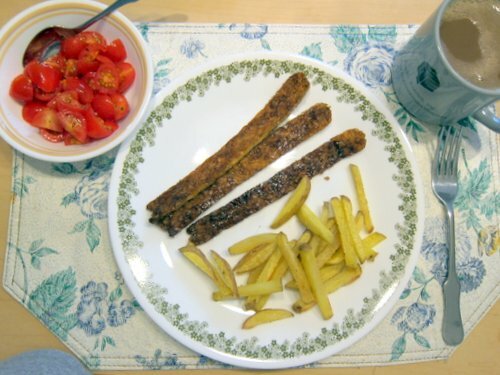 While Gimme Lean has a great vegan soy sausage product that would be great for this type of meal, I was really craving something smoked. So, I grabbed half a cup of dry soy curls and improvised. 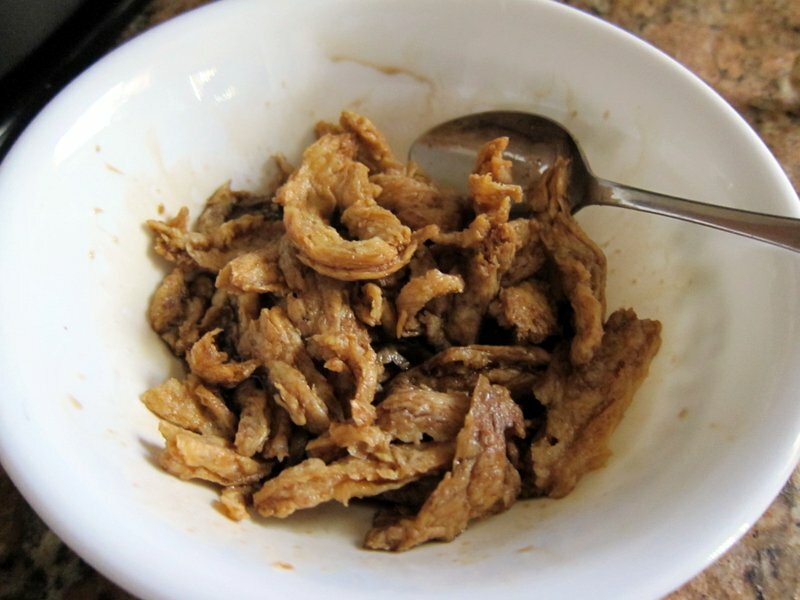 While the soy curls were rehydrating, I mixed together about 2 tbsp of soy sauce, 2 tbsp of agave nectar, and added a few drops of liquid smoke. I have never used liquid smoke before, but I read in some places to be careful about the amount used. So, I tried to be conservative without even really knowing what that meant. Let’s just say that I wish I had put a few more dashes of liquid smoke in the mix. Once the curls were rehydrated, I drained them and let them marinade in the mixture for a few minutes. 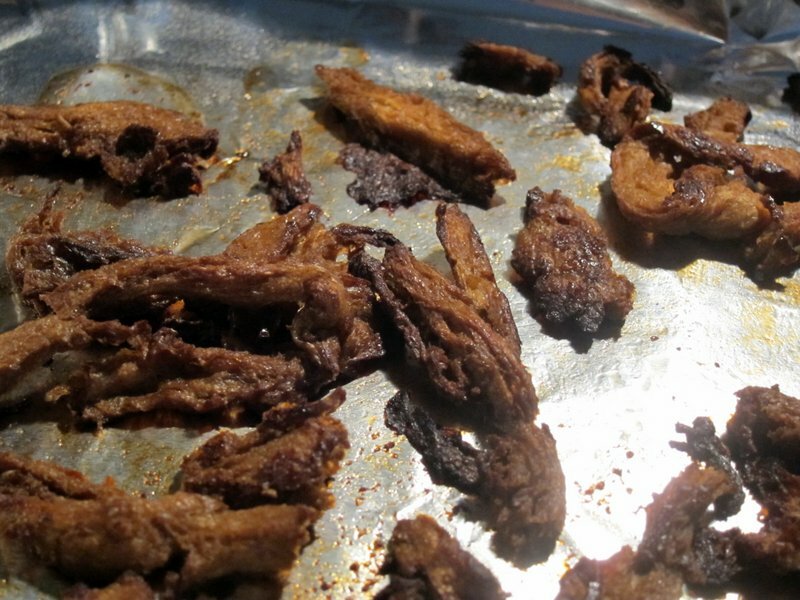 I baked the soy curls in the toaster oven at 300 degrees for 15 minutes. While it was baking, I fried some brown rice in garlic, and cut up some tomatoes and green onion which I seasoned with salt and pepper.